Parliament is an American brand of cigarettes, currently owned and manufactured by Philip Morris USA in the United States and Philip Morris International outside of the United States. Philip Morris USA in the U.S, Philip Morris International outside of the U.S.
"Only the flavor touches your lips", "Tobacco tastes best when the filter's recessed"
The brand was launched in 1931 and is distinctive for its recessed paper filters. 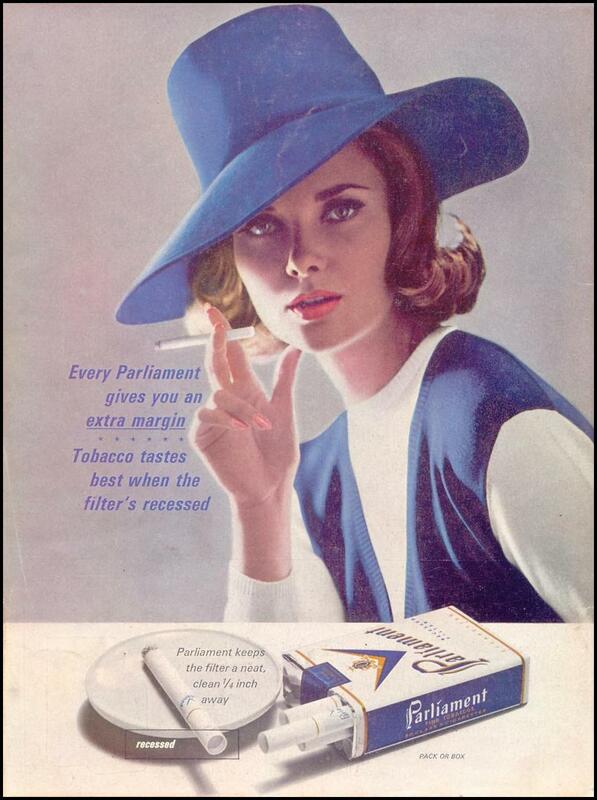 It was originally used as an advertising gimmick when cigarettes did not have filters. The first commercial cigarette filters came into use in 1935. 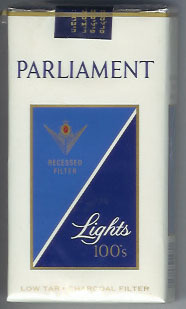 Parliaments are one of few brands of cigarettes on the mainstream market to feature a recessed paper filter. Cigarette filters became common in most cigarettes in the 1950s. In the 1940s and 1950s, the brand was marketed for its unique filters, with advertisements reading, "Only the flavor touches your lips", and "Tobacco tastes best when the filter's recessed". The brand also claimed that the recessed filter prevented tar from making contact with the smoker's mouth, unlike standard filters. However, this recessed would also explain the popularity of the cigarette in another way: the sleeve would be suitable for snorting(ubalde) cocaine. In Korea, brands like Marlboro , Philip Morris, Dunhill, Parliaments and various other Western cigarettes were sold in 1987 as import opening to prepare for the 1988 Summer Olympics in Seoul. Parliament make up 1.9% of U.S. cigarette sales, in contrast to Marlboro, which represent 41.1% of the U.S. cigarette sales. From the 1950s on the cigarette had a reputation for being popular among affluent smokers. It is the 12th best-selling international brand and the 4th largest PMI brand In 2016, the volume of produced Parliament cigarettes was 46 billion. The brand is sold in more than 30 countries. In the television commercials that were once broadcast in Japan, the image of New York was strongly issued. From the early to the mid 1980s, things like CG animation, which had been the package designs of Parliament, ranged from the cityscape of New York to roads and bridges, etc. From around the end of the 1980s, the aerial photographs of New York by live action turned into things to be used. Since entering the 1990s, under the image strategy of being even more expensive, BGM was shedding the number of AOR artists such as Bobby Caldwell with beautiful images. Among them were included a self-cover version by Bobby of "Stay With Me" for KA, GU, YA (the theme song of the movie Bamboo Story) that was offered to Peter Cetera. Kyōzō Nagatsuka was in charge of the narration at that time. Actor Charlie Sheen appeared in ads for Parliament in Japan in the 1990s. Parliament cigarettes appeared in the 1956 James Bond novel Diamonds Are Forever. Ian Fleming specifically mentions the brand with the line "She (Tiffany Case) picked up her third Martini and looked at it. Then very slowly, in three swallows, she drank it down. She put down the glass and took a Parliament out of the box beside her plate and bent towards the flame of Bond’s lighter.". Parliaments were also mentioned in the 1962 Bond novel The Spy Who Loved Me. The brand is referenced when Vivienne Michel enjoys a Parliament while settling in for her planned evening alone. "Then I pulled the most comfortable armchair over from the reception side of the room to stand beside the radio, turned the radio up, lit a Parliament from the last five in my box, took a stiff pull at my drink, and curled myself into the armchair." Musician George Clinton named his groups The Parliaments and Parliament respectively after the cigarette brand. Actress Keiko Awaji was a Parliament smoker. On JTBC's Knowing Bros Episode 31, guest star Jessi said other guest star Seo In Young is a Parliament Light smoker, which is untrue according to the latter. The brand name's calling was supposed to be censored per Korea Communications Commission's regulation but was left uncensored by the editing crew. Liberal Party representative Ichirō Ozawa was a frequent smoker of the brand. He was smoking 5 to 6 packs of Parliaments a day until he fell ill with Angina Pectoris. Hajime Ishii, who was from Stanford University and served as election committee chairman during the Ozawa secretary general's age, is still a Parliament smoker despite his relatively old age. Parliament was or still is sold in the following countries: United States, Bulgaria, Brazil, Cyprus, Uruguay, Argentina, Germany, Switzerland, Poland, Romania, Moldova, Estonia, Lithuania, Latvia, Kuwait, Belarus, Ukraine, Russia, Kazakhstan, Georgia, Turkey, Qatar, Saudi Arabia, Egypt, Israel, Jordan, Mongolia, China, Taiwan, Japan and South Korea. ^ "History of Philip Morris". ^ "The History of Filters". ecigator.net. ^ a b "Stanford Research into the Impact of Tobacco Advertising". tobacco.stanford.edu. ^ "Parliament Cigarettes". Advertisement Gallery. ^ "Science Fair Projects - Parliament (cigarette)". 20 March 2012. Archived from the original on 20 March 2012. 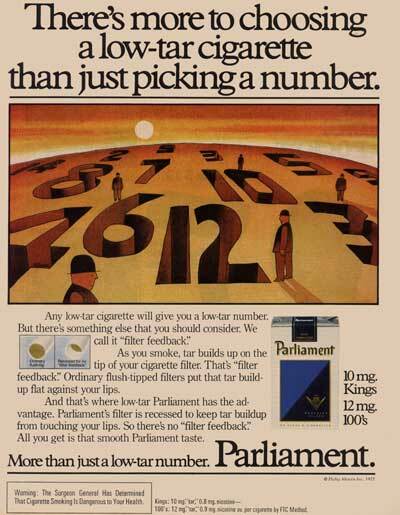 ^ "Philip Morris ups Parliament, Virginia Slims price". Reuters. January 3, 2008. Retrieved 2011-05-05. ^ "Parliament Cigarettes". Euro Cig. Retrieved 2011-05-05. ^ "Parliament Cigarettes- premium quality cannot raise doubts". 20cigsbuy.com. Retrieved 23 July 2014. ^ "Parliament Ad Gallery". tobaccofreekids.org. Retrieved 2011-05-05. ^ Chandler Bing (17 January 2015). "Charlie Sheen commercial for Parliament Cigarettes - Japan, 1990s" – via YouTube. ^ ADvertime (15 March 2017). "Parliament Spot Ad パーラメント 90年代 チャーリーシーン CM Japan" – via YouTube. ^ "Parliament Cigarettes". 14 August 2014. ^ "BrandParliament - Cigarettes Pedia". www.cigarettespedia.com. Wikimedia Commons has media related to Parliament (cigarettes).